The Collab Blog: What happens in your classroom the first day of school that makes students run to be there the second day? What happens in your classroom the first day of school that makes students run to be there the second day? 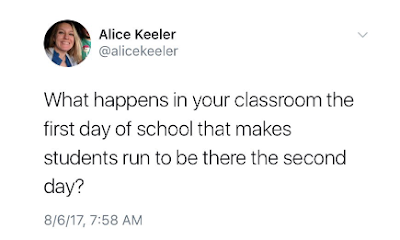 This recent tweet by Alice Keeler reminded me how important it is to consider what we do in our classes on the very first day. Do we engage our students in such a way that they look forward to returning the next day? Today on the first day of classes at Elk Grove High School, I realized the Physics team had an answer! Eleanor Pattie invited me to her Physics class where teams of students were engaged in a problem-solving design activity. Eleanor credits fellow Physics teacher Phil Winter for suggesting the activity. Along with Eleanor and Phil, the other Physics teachers planned to do the same activity as well: Mary Kemp, Chris Rogers, Tom Boczar and Peter Wang. Design a free-standing chair using paper and masking tape with at least 4 legs and a back that can hold more books than any other team's chair. Teams brainstormed and asked each other a lot of questions to decide how to best tackle the challenge with their limited supply of paper and tape. They came up with very different ideas and began testing them out. They tinkered, assessed and revised their ideas to decide on the best plan. After trying out a few ideas, they began building. After the chair building was complete, they began stacking the books, and assessing the integrity of the structure. Would it work? Feeling confident, another group began stacking. Six books and preparing for more. Time passed. More books. Another group wondered. . . 28 books?!! Would it hold for five seconds? Oh the suspense! Would it hold even more?!!!! 30 books?!!! The team steadied them for another five-second test. Could they be outdone by another group?! 11 books . . . then three more . . .
23 books and counting! But wait, those extra big books count for two! That's 56!!! Bravo! The winning group of the day with 69 books atop their paper chair!!!!!! From the very first day the students were thinking like physicists. The design challenge with constraints was a a problem solving activity that got them working in groups, asking questions, posing solutions, testing hypothesis and reflecting on their results. All of that, and they had fun, too. I'm guessing they'll will be looking forward to going back to class tomorrow! A shout out to the physics team for sharing their ideas, and Eleanor for inviting us in!